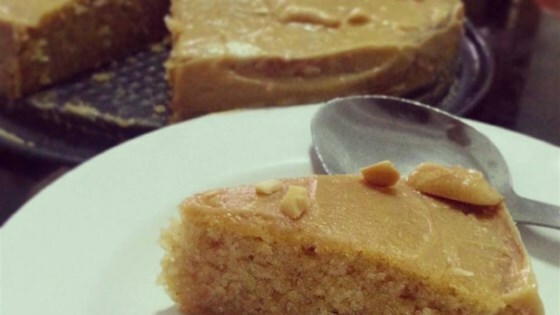 "If you like peanut butter without chocolate, you will love this cake. If you don't have cream, you may substitute milk." Preheat oven to 325 degrees F (165 degrees C). Grease and flour two 9 inch round cake pans. Combine 1/2 cup peanut butter and 1/2 cup butter or margarine. Cream until light and fluffy. Add eggs one at time, mixing well after each one. Add cake mix alternately with the water. Stir until just combined. Pour batter into prepared pans. Bake at 325 degrees F (165 degrees C) for 25 minutes or until cake tests done. Allow cakes to cool in pan for 10 minutes and then turn out onto a cooling rack to cool completely. Assemble and frost with Peanut Butter Frosting once cool. To Make Peanut Butter Frosting: Combine 1 cup peanut butter, and 1/2 cup butter or margarine cream together until light and fluffy. Add the confectioner's sugar. Mix in enough cream to make the frosting of a spreading consistency. Apply to cool cake. I really like peanut butter, so this was excellent! The icing tastes like whipped peanut butter fudge. I am keeping this recipe to hand down to my kids! I didn't really care for the overwhelming peanut butter flavor in this cake. Maybe with chocolate frosting it would be a little more subtle.